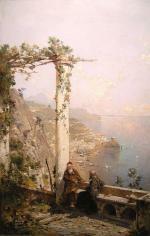 Museum quality coastscape with two monks on the terrace of the capuchin monastery San Francesco, in the background view of the coast and bay of Amalfi. 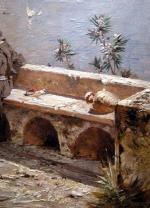 This romantical painting was executed in 1888 by world famous Austrian landscape painter Franz Richard Unterberger (1838 - 1902),who recieved world acknowledge for his south italian coast views. 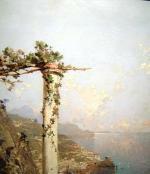 His views of south Italy arrive very high estimates by the international auctions (until 240000 USD ). 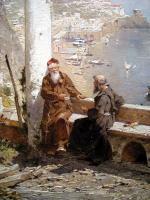 The son of an art dealer, Franz Unterberger was born in Innsbruck, August 15, 1838. 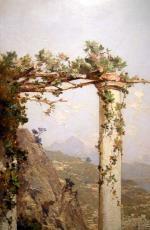 Unterberger first studied at the Munich Academy in 1853 with Clemens von Zimmermann and Julius Lange and then continued his training at the Weimar Academy under Albert Zimmermann. He visited Milan in 1858 but returned to Munich the following year due to the unsettled political situation. In 1859, Unterberger enrolled at the Dusseldorf Academy where he joined the Achenbach brothers, who became famous for their landscapes.Between 1860 and 1874 Unterberger visited and painted in Norway, then in Belgium. He settled in Brussels in 1864, where he spent the rest of his life. 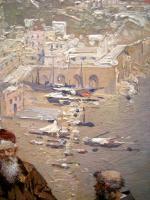 During this period, he usually spent summers at Neuilly-sur-Seine (outside of Paris), and from there he often visited Sicily and southern Italy, notedly Naples and its environs where he painted some of his best pictures. 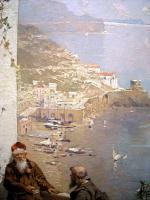 Unterberger also traveled along the coast of England and Scotland. 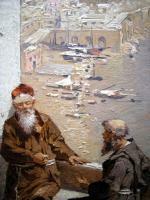 These trips provided inspiration for many of the artist’s finest paintings. 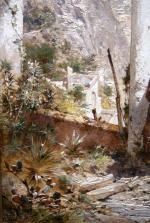 He also found great success in Vienna, where he exhibited and received several medals, including the Order of Francis Joseph.He was a romantic style painter of landscapes, genre, architectures, and water scenes. 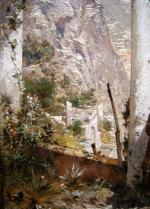 Unterberger is best known for his scenic paintings Italy, which feature intimate views as well as large vistas of the country’s iconic cities. Unterberger’s romantic atmospheric style of painting remains very popular and his works can be found in important private and museum collections throughout America and Europe. 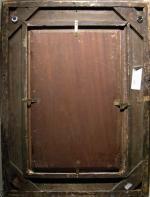 Museum Collections Include: Louviers; Innsbruck Ferdinandeum; National Gallery, Melbourne; Troyes Museum . Literature: H.Fuchs Dictionary "Die Osterreichischen Maler", Vienna, 1975, Thieme/Becker "General Arists Lexicon" (in German), Leipzig, 1999. Inscription: signed lower left , on the reverse of panel inscribed by the author : " Fr.Unterberger, Bruxelles, (18)88". 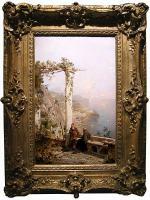 Technique: oil on mahogany wood panel, Luxuriousy original period gold-plated frame. Measurements: unframed w 13 1/3 " x h 16 " (36 x 57,5 cm), framed w 20 4/5 " x 23 2/3 " (62,5 x 84 cm).